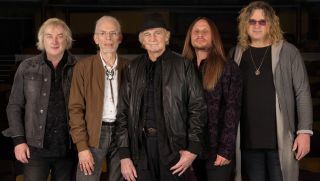 The full performing lineup for Yes’ Cruise to the Edge has been announced. The five-night progressive rock experience, which runs from February 4-9, 2019, sails out of Tampa, Florida aboard Royal Caribbean’s Brilliance of the Seas and visits ports in Key West, Florida and Cozumel, Mexico. Alongside Yes and previously-announced artists including former Genesis guitarist Steve Hackett, Mike Portnoy, Riverside, Fish and Dream Theater’s Jordan Rudess, new additions to the all-star line-up include: The Neal Morse Band, featuring Neal Morse (lead vocals, guitars, keyboards), Mike Portnoy (drums, vocals), Randy George (bass), Bill Hubauer (keyboards, vocals) and Eric Gillette (guitars, vocals); The Sea Within, featuring Swedish guitarist and singer-songwriter Roine Stolt, bassist Jonas Reingold, guitarist Daniel Gildenlöw, German drummer Marco Minnemann and American keyboardist Tom Brislin; Rachel Flowers; the Adrian Belew Power Trio; Focus; Haken and Brook Hansen. Limited cabins are still available, beginning at $1,299 per person, double occupancy. For booking and more info, visit CruiseToTheEdge.com. See below for the full Cruise to the Edge lineup.